On 6 March 2018, the Scottish Parliament chamber debated LEADER, the EU’s rural development fund, following a motion submitted by Mairi Gougeon MSP. 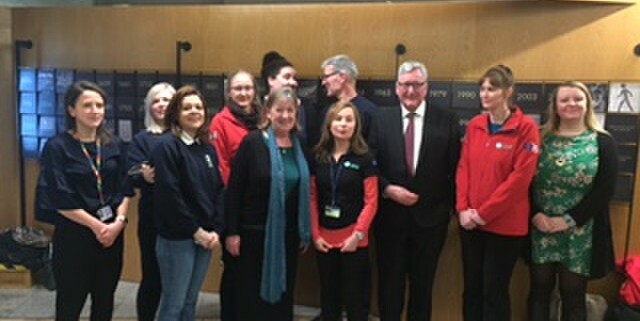 The debate followed an initial meeting between Members of the Scottish Parliament, ESEC EU officer Joanne Scobie and the LEADER Forth Valley Lomond programme manager, Anne-Michelle Ketteridge. The meeting provided the opportunity to highlight the spend of the LEADER programme in Scotland to date, and the amount of approved and in progress projects. It was noted that while LEADER is a demonstrably valuable programme for rural communities, it is not as visible as it should be, which is of great concern particularly in the light of Brexit. Ten MSPs from across the political divide took part in the debate, with the SNP, Labour, Conservatives and Liberal Democrats all contributing. It was a well-informed and passionate debate. Each of the MSPs who took part were vocal in their support of LEADER and referenced projects from their own constituencies, which served to highlight the genuine quality, innovation and diversity of the programme. Examples of these projects included; tea and vodka in Angus, Strichen Townhouse being refurbished to include a library, museum and archive, the Wigtown book festival, the tag-n-track project of barn owls and lesser black-backed gulls at Clyde Muirshiel regional park, Seed to Soup which develops horticultural skills in young people, the first distillery in Inverclyde for decades, an indoor horse riding arena in Inverurie which will provide facilities for disabled people, and the restoration of three ecologically important estuaries in Fife. While each MSP spoke with enthusiasm about the impact and the legacy of the programme, there were differing positions on what next for LEADER and rural development funding once we are no longer a member of the EU. Peter Chapman (Conservative, North East Scotland) stated that the responsibility for the design and implementation of a Scottish rural support system will be in the hands of the Scottish government. Joan McAlpine (SNP, South of Scotland) said that any future funding mechanism should have no negative detriment for Scotland and current levels of funding must be maintained (outwith the Barnett Formula). Liam McArthur (LD, Orkney Islands) spoke of his own wife’s experience as a LEADER beneficiary and said that there is room for improvement moving forward, with scope to simplifying the application process and guidance, all of which should be supported by a more intuitive technology system. The concluding remarks were provided by Mr Ewing, who commended LEADER for its successful bottom-up approach and its success in levering in match-funding. On the successor programme, he said he had written to Michael Gove, Secretary of State for Environment, Food and Rural Affairs, for clarity on funding once the current LEADER programme (2014-20) closes, and also voiced his support for the same 7 year budget cycle (2020-27). Mr Ewing said it should be for communities to decide on the funding mechanism which will deliver rural development support post-Brexit. If it is indeed the Scottish Government which will be responsible for the design of the replacement Scottish rural support system, then the grassroots collective of local government, LEADER local action groups, and communities themselves stand ready to contribute and to share recommendations and examples of best practice. Mr Ewing rightly pointed out that people do not want an “political argy-bargy” but rather the knowledge that when the current programme ends in 2020, there will a subsequent multi-year programme in place to take over. We would like to thank Mairi Gougeon MSP for submitting this motion for debate and her clear commitment to LEADER. We would also like to congratulate her on her pronunciation of the LEADER acronym (in French) “Liaison entre Actions de Développement de l’Économie Rurale”! Finally, we are impressed with Mairi’s ongoing mission to having Mr. Ewing attend Bonfest in Kirriemuir, the annual AC/DC music festival which itself was borne of a LEADER grant. The Cabinet Secretary offered his apologies on this occasion, professing himself to be more of a Leonard Cohen fan. See here for a transcript of the debate.